New book! Darker Shades! | Robert E. Wronski, Jr.
Stop the presses and Happy Halloween! The first publication from Wild Hunt Press — founded by yours truly *takes a bow, careful not to pull a disc* — is now available for pre-order in digital format and for free rental for those who have Kindle Unlimited. It goes “live” on Halloween! 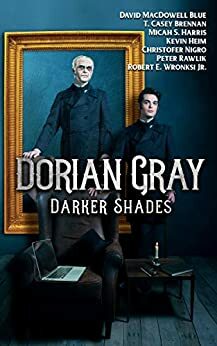 It’s just $2.99 for the first ever anthology of new prose tales devoted entirely to the character of Dorian Gray. And it’s the first official publication from Wild Hunt Press. It includes short stories by Ivan Ronald Schablotski, T. Casey Brennan, and Peter Rawlik; novellas by Micah Harris and yours truly; a short play by Zahir Al Daoud; and an extensive, detailed Dorian Gray Timeline describing his entire history as part of the Wild Hunt Universe (WHU) and various alternate universes and futures co-authored by the master of the craft, Robyn Wronski and yours truly. It was a huge honor for my first publication to receive submissions from this august body of authors, and I shall forever be thanking the Great Pumpkin for this awesome gift! Which I also extend to you, of course! The print version is in the works and shall be available soon! Spread the word as far as you can and give yourself a special treat for Halloween! (In other words, buy it lol! ).